Regarded by those in the know as one of the greatest DJ’s in the world – Sao Paolo’s DJ Marky returns to Bangkok for what promises to be another killer party. He’s just released his 50th track on his own ‘Innerground’ record label & his HUGE bi-monthly ‘Marky & Friends’ residency at London superclub, Fabric, is stronger than ever. If you’ve been at a party Marky has been playing at – you’ll be back. If not – don’t miss this chance to party like you never have before – in TRUE BRASILIAN STYLE! 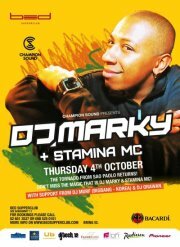 Hosted by the incredible STAMINA MC – Marky’s MC of choice.